Editor’s note: Doing more with less is always an applicable mantra for content marketers. That’s why we brought back this post about how to amplify your best content. Admit it: When the stress and exhaustion of finding something uniquely delightful for every person on your holiday shopping list have brought you to the brink of madness, you’ve at least considered the idea of regifting. After all, that expensive orange scarf that sadly clashes with your skin tone, the never-opened kitchen mixer you got for your bridal shower, or that trendy toy your child never got around to playing with are all lovely gifts. And who knows? They even may be meaningful treasures to someone who needs them. Like the weary holiday shopper, content creators are always pressed for time, eager to please, and challenged to deliver something of value to everyone on the subscriber list. But who’s to say your best content gifts can’t be existing assets resurrected, repurposed, repackaged, and resurfaced? If you are familiar with content curation, you know it typically involves third-party content – taking great insights you discovered and putting your brand’s spin on them (making sure you credit the original source, of course) to create something new and useful for your audience. 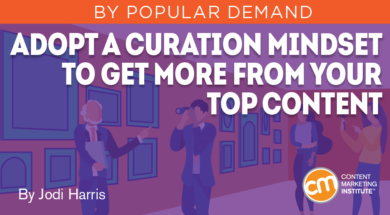 But you also can apply a curator’s mindset to your own content assets, which opens exciting opportunities to reuse and amplify your highest-value assets – i.e., the content already driving good results – rather than taking your chances with new, unproven content ideas. Ready to give this kind of curated regifting a try? Follow these tips. Naturally, you can’t repurpose your top-performing assets unless you know what they are. You need at least a snapshot view of which content is performing well enough to feature in your curation efforts. Here are some ways to gather that information. Review the content in your archives. Even a simple, high-level inventory – a documented list of the content published, the topics covered and when, the format of each piece, and the platforms where the assets were distributed – can help you track down the materials you have to work with and make it easier to compare their relative performance as a next step. TIP: For a more detailed view of audits, read Arash Ashli’s post, How to Do a Content Audit in a Few Hours. Identify which assets in your at-a-glance review have the best potential to further your content marketing goals. Consult your analytics data to add key metrics like page views, social shares, time on site, and conversion rates to include for individual assets in the inventory. 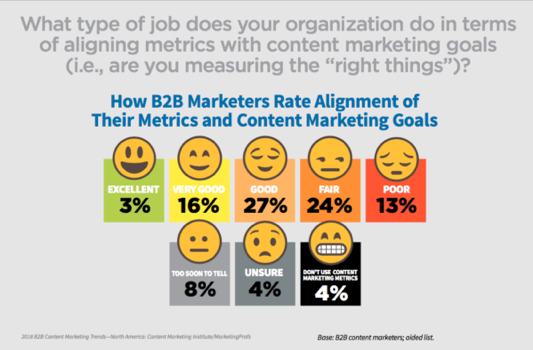 This will enable you to conduct an audit to analyze your content’s relative value. You can weed out low-performing and low-converting efforts, as well as content on topics past their expiration date. The remaining content on your list is likely worth considering for your repurposing efforts. TIP: For most questions about your content’s performance, Google Analytics can provide the answer. Learn how to uncover some of its most useful insights in CMI’s e-book How to Apply Analytics Data to Make Better Content Marketing Decisions. Naturally, you want to resurface content still at the peak of its engagement potential since people tend to share the more recent pieces. However, even older content pieces can have merit, especially if they still drive strong traffic via search, as that indicates there’s still a great need for information on those topics. TIP: Not sure how to locate organic search data in Google Analytics? Michele Linn outlines the path to this report – and how to act on what you find – in her post 4 Google Analytics Reports Every Content Marketer Should Use. Your analytics should have revealed viable candidates for successful reuse. But just because those pieces resonated once doesn’t mean they meet the needs of your audience now. Take a few extra steps to confirm their continued relevance and relative value to hit the curation sweet spot between business performance and audience need. In addition to checking the search traffic to your content pieces, do some broader research on the search volume and keyword rankings for the terms most relevant to your content. Not only will this process help you evaluate current topical trends, it can give you an idea of how to prioritize your team’s efforts and position internally curated content for better performance against your competition. TIP: Not sure how to mine the data you need for keyword decision-making? Let Mike Murray’s 2019 SEO Keywords and Google: What’s in Your Poker Hand? post serve as your primer. For example, Vertical Measures’ Arnie Kuenn suggests starting with a ranking audit on your highest performing and converting pages to see how they fare on relevant SERPs, and which terms contribute to the best rankings. (Tools like SEMRush, Google Search Console, Moz, and AuthorityLabs can help you with this process.) In addition, Arnie suggests conducting ideation research, which looks at the most relevant keywords your content is not ranking for to uncover informational gaps that you can fill through curation. No matter how you produce your content, make sure what you share is unique and valuable, and that it differentiates your business from its competition. Taking stock of what content is out there and how well it is performing is the only way to get a sense of the relevant informational needs that aren’t filled by your direct competitors – or other content sources competing for your audience’s attention. 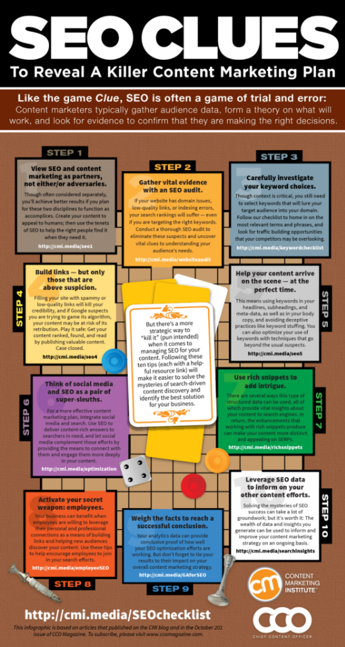 TIP: Not sure how to take inventory of your content competition? Check out Ellie Mirman’s three-step process on how to conduct a competitive content marketing analysis. Analytics data can lead your initial decisions on what to curate, but there’s a lot to be said for getting insights on what content your audience wants right from the horse’s mouth. For example, mining user feedback shared through social channels, posted in your comments section, or offered in conversations with your sales team can reveal valuable insights you can use to prioritize your curation efforts. For example, in his presentation at Content Marketing World, Andy Crestodina mentioned he keeps a folder of all the questions people have asked him via email. At regular intervals, he reviews the topics people asked about most, and compiles content pieces to provide answers to those questions. Not only can mining the above data points help you decide which content pieces to repurpose and how best to position the new assets for optimal discovery, it also can provide helpful clues to the content format preferences of your audience. For example, if you find that many consumers typically connect with your business through their mobile devices, focus repurposing efforts on turning your text-based assets into touch-friendly formats like quizzes or interactive apps, as well as video, audio, or image-based content because those formats still work well on small screens. Or, if you have an active community of fans on channels like Instagram, Twitter, or Facebook, break your long-form content into shorter, more digestible snippets to parse over email or repurpose as easily shareable formats like infographics, checklists, or brief tutorials. Once you’ve identified your most viable content candidates and have a general understanding of how to package and position them for optimal engagement, get down to the real business of reusing your assets to increase their value and reach. While there are myriad ways to curate third-party content from the internet, when you focus exclusively on amplifying your content assets, approach it in one of the following four ways. When audiences get overwhelmed by content bombarding them (as we all often do), even content from their favorite creators can slip through the cracks. If an asset’s value hasn’t diminished since it was first published but its performance has started to slip, republish it. The content can make its way back into readers’ feeds and onto their radars. Be sure to redirect the old URL to the new one so the content doesn’t run afoul of Google’s duplicate content penalties. Example: At regular intervals, CMI’s social media team rescues one of our older posts from obscurity row and reshares it on our social channels like Facebook, Twitter, and Instagram. Our newer fans and followers discover some of our best content, while our veteran subscribers may discover great content they missed the first time around. Often, your data mining turns up relevant content pieces that are still driving strong search traffic yet feel too stale or outdated to republish as is. 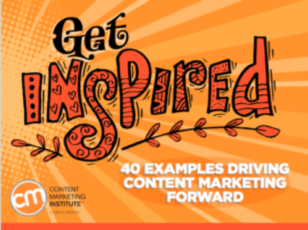 Rather than letting them languish in your archives, rejuvenate them with an updated title, takeaways, and examples, and make them more actionable by including the latest perspectives and insights on the topic. This technique involves deconstructing your long-form content – like blog posts, white papers, and e-books – into smaller, modular assets. Those assets can be combined with other relevant information on the topic to form a new piece that might be more attractive to different audiences. Think of it like a meal at Chipotle: If you unwrap that burrito and put the rice, beans, meat, cheese, and salsa on a bed of lettuce, you’ve repackaged the ingredients to make it more appealing to those who want to reduce their consumption of carbs. Extract the best insights, explanations, and advice from multiple posts that cover different facets of the same topic and combine them to form a more comprehensive discussion on the subject – like the CMI team did for our social media survival guide. 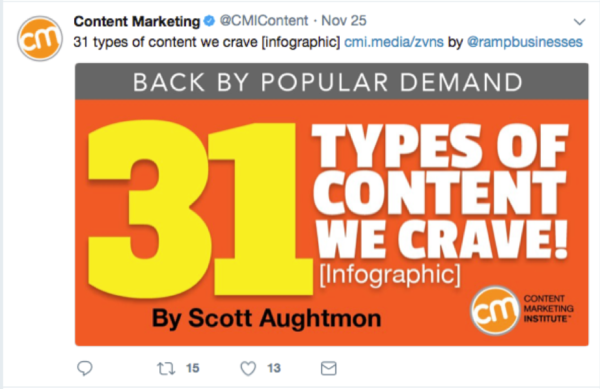 Though some content marketers consider repurposing the same thing as repackaging, I look at them as two related yet distinct processes. Like repackaging, repurposing involves deconstructing your original assets; but rather than reusing the components in combination with other content pieces, they’re refashioned into a new form of conversation. The message itself remains mostly intact – it’s just tailored to suit a different purpose or platform. Turn text-based process descriptions or bulleted lists into graphic checklists or infographics, which are much easier to understand at a glance. Take complicated technical content – like white papers or installation manuals – and turn them into brief video tutorials that guide users through each step. Take the audio track from video interviews or in-person presentations and turn them into podcasts for those who might prefer to catch the conversation during their commute. Put data-heavy content pieces like research reports into a more stimulating and memorable context using charts, graphs, or other forms of data visualization. Repurpose lengthy, advice-driven discussions into a series of tip guides delivered gradually through an email drip campaign. Add captions, emojis, motion, or interactive features to images and illustrations to make them more engaging, entertaining, and shareable on social media. Please note: All tools included in our blog posts are suggested by authors or sources, not the CMI editorial team. No one post can provide all relevant tools in the space. Feel free to include additional tools in the comments (from your company or ones that you have used).